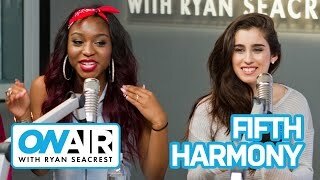 Fifth Harmony stopped by the studio and talked about their run-ins with Chris Brown and T.I. KIIS-FM on-air personality schedule featuring ... "This Girl Can't Handle The Fact That Hello Kitty Isn't Actually A Cat"
Fifth Harmony Love Each Other: Fave Things About Each Member! + New Music & Album Revealed! Fifth Harmony Talks Blocking Harry Styles, Crushes, Instagram Confessions & More!